With the holidays quickly approaching, a lot of people are on the hunt for the best Christmas gifts for kids in hopes they can surprise the little ones in their lives with super cool Christmas gifts they’ll love. 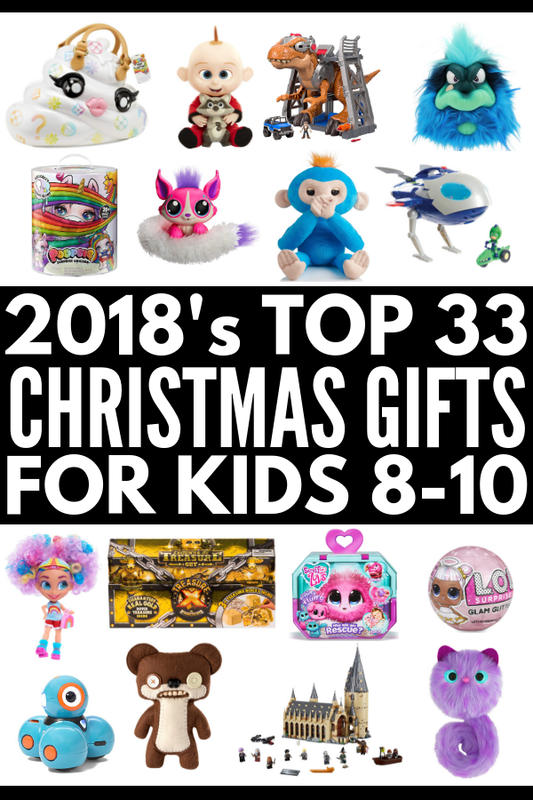 Whether you’re specifically looking for Christmas toys for girls or boys, or just want to know what the most popular kids toys are these days, we’re sharing 33 ideas that will NOT disappoint! When it comes to buying Christmas gifts for kids, there are some things you should consider before taking the plunge. Popular kids toys can be pricey, especially during the holiday season, so before you start your online shopping (or head to your local toy store), keep these 7 things in mind. Get up to speed. While gift guides are a great way for us to discover what the best Christmas gifts for kids are each season, chances are there are a few items on your child’s holiday wish list that aren’t part of any popular kids toys roundups. Kids fall in love with toys they see at stores, in YouTube unboxing videos, and at their friends’ houses all the time, and while these items may be older and not make it onto any ‘cool Christmas gifts’ lists, your little one might love these toys more than anything else Santa leaves them. Plan ahead. Popular kids toys fly off the shelves VERY quickly as the holidays start approaching, so if your kids are eyeing something specific, you want to make sure you make a move sooner than later. I’ve seen so many parents commit the cardinal sin of promising an item to a child for Christmas and then leaving it to the last minute, at which point they end up paying double (or triple!) the price on eBay. I speak from experience when I suggest asking your child to make up his or her Christmas list mid-October so you can identify the popular kids toys that are likely to fly off the shelves and purchase them before the holiday rush. Is it practical? If you’re buying a toy for someone else’s child, take a moment to consider the practicalities of the item before you move forward with your investment. Does it require odd-sized batteries? Is it super loud? If it connects to the internet, are there parental controls? Is it age appropriate? When you’re searching for the best Christmas gifts for kids, you also want to make sure you are choosing something that is age appropriate. I find this particularly important when it comes to buying Christmas toys for boys as many of them are centered around movies and video games that may not be appropriate for all age-ranges. Do a quick search on the internet and talk to the child’s parents if you’re not sure. 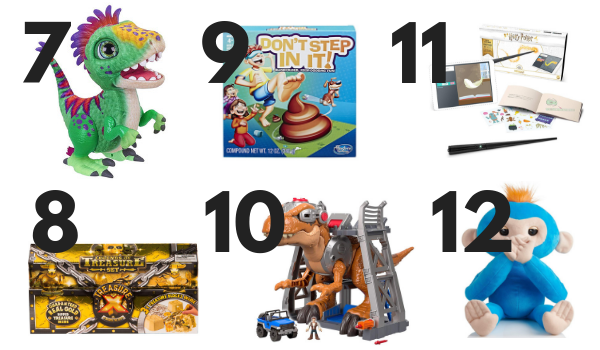 RELATED: 99 Stocking Stuffers for Kids 7 and Under! What skills does it target? While I like to use Christmas as an excuse to buy my daughter toys that are completely devoid of any educational component – LOL – I always make it a point to find a few items that help develop certain skills she’s either struggling with or will be working on in the months to come. This was more of a focus when she was younger, but I often find the best Christmas gifts for kids have some sort of learning experience already built into them, even if it’s just developing fine motor skills and/or hand-eye coordination. Will it grow with your child? If you’re investing more than you usually do on a toy for one or more of the kids in your life, you will probably want to think about how long the child will be able to play with said toy. I often find electronic devices geared towards kids have a relatively small age range, and prefer investing a little more money into a higher end product that can grow with my child over a few years. Is it practical? When it comes to finding the best Christmas gifts for kids, I admit that practicality isn’t really high on my list of priorities as I’m much more interested in the joy that comes from giving children exactly what they’ve asked for. Having said that, practicality does come into play for bigger purchases as I’m not willing to fork over a ton of money for something that will get used a few times before being tossed into the basement and forgotten. I also think long and hard about toys that take up a lot of room (where will we store it when it’s not being played with?) as well as outdoor toys and play sets (how will they withstand the cold climate and how often will my daughter really play with them?). And now for the fun part! If you’re looking for the best Christmas gifts for kids, I’ve rounded up 33 of my favorites below, and while I have divided them into 2 sections – the best Christmas toys for girls and the best Christmas toys for boys – we aren’t really in the habit of assigning a gender to toys in our house. My daughter naturally leans toward popular kids toys for girls now that she’s in grade two and her BFFs are all into dolls, but we have tons of toys in our basement that are touted as ‘boys toys’, and she rocked a Rusty Rivets backpack all through grade one. So, I speak from experience when I say a lot of these toys will appeal to both boys and girls! Like many other kids, my daughter thoroughly enjoys watching toy unboxing videos on YouTube, and while we have some pretty strict rules around iPad usage in our household, I have to admit that I rely pretty heavily on YouTube when it comes to finding the best Christmas gifts for kids each year. If you’re specifically looking for Christmas toys for girls, my daughter either owns or has a friend who owns all of the toys listed below, and they come highly recommended by both of us! I was on the fence when my daughter begged me to buy her a Fingerlings Hug when we were in the US over the summer. We already owned a couple of smaller Fingerlings at the time and I felt the novelty of them had worn off, and I wasn’t sure how we’d get Bella into our suitcase, but I ended up relenting and this was perhaps one of the best purchases I’ve ever made since becoming a mom! Bella’s long arms are perfect for hugging, and she does so many fun things. She makes adorable noises when you throw her in the air, she burps and toots, she giggles when you tickle her tummy, and she can even record and repeat things you say to her. Bella comes grocery shopping with us, she sleeps in bed with my daughter each night, and she has provided endless entertainment to our entire family. I highly recommend this toy! We saw the Poopsie Slime Surprise Unicorn the last time we were in the US but I refused to buy my daughter one given the price tag, and I really, really regret it. 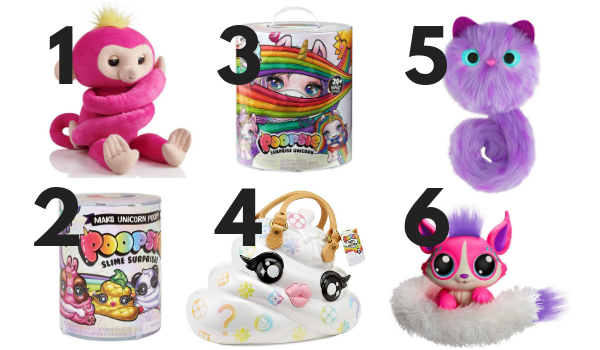 From what I gather, the Poopsie line of toys are going to be THE best Christmas toys for girls this year, and if you don’t want to fork over the cash for the Surprise Unicorn and/or Pooey Puitton toys (see below), these surprise packs are a great runner up. Each pack includes 10 surprises, including unicorn food (this is actually slime powder) and unicorn magic, a collectible bottle, and a poop character keychain. Kids these days seem to be obsessed with slime and all things related to poop, which makes the Poopsie Slime Surprise Unicorn one of the best Christmas gifts for kids. This set includes a surprise unicorn with a shirt, diaper, and hair brush, 4 unicorn food packets, 4 unicorn magic packets, an exclusive bottle and poop character keychain, and a glitter potty, and according to my 7-year-old and a lot of the YouTube videos we’ve watched, this is what girls everywhere want to see under the tree this year. Okay, full disclosure here: I think the name ‘Pooey Puitton’ is pretty genius and I may or may not have already ordered this toy for my daughter for Christmas. Inspired by Louis Vuitton, this set is all about making unicorn rainbow poop and includes a Pooey Puitton purse, 12 unicorn food packets, 6 unicorn magic packets, 4 unicorn sparkle packets, 2 unicorn crunch packets, 4 mystery scents, an exclusive bottle, and an exclusive poop character keychain. You’ll notice that there is no unicorn in this set, so if you’re going to go the Poopsie route this Christmas, my suggestion is to go big or go home and get the Poopsie Slime Surprise Unicorn AND Pooey Puitton. My daughter was gifted a Pomsie by her camp counsellor at the end of the summer, and we’ve had a lot of fun with it. You can wear them on your wrist or twist them around your backpack, and I love how interactive they are. With touch sensors and over 50 sounds, Pomsies communicate different feelings and they have a super fun dance mode. They remind me of Hatchimals, but at a fraction of the price, they are a lot more cuddly! Lil’ Gleemerz are pretty similar to Pomsies in that they respond to touch, play games, and have a bunch of cool and adorable sounds, but they are much more interactive. They tell jokes and say funny phrases, and I particularly love that their tails light up in time to the beat of music (or the sound of someone’s voice). This looks really cool in the dark! If you’re looking for the best Christmas gifts for kids and can’t decide between a Pomsie and a Lil’ Gleemerz, my vote would be for the Lil’ Gleemerz. It’s much more interactive, and my daughter plays with it much more frequently than her Pomsie. Don’t be fooled by how small and simplistic Twisty Petz look. With over 70 to collect, these bejeweled petz are fabulous for developing fine motor skills and they transform into beautiful rings and bracelets that can be connected together to make necklaces. I bought several of these for my daughter to play with during a long plane ride over the summer, and they continue to be a hit with her and her friends. If you’re looking for stocking stuffers for kids, or just need a little something extra to add to another gift, L.O.L. Surprises! are always a good option. 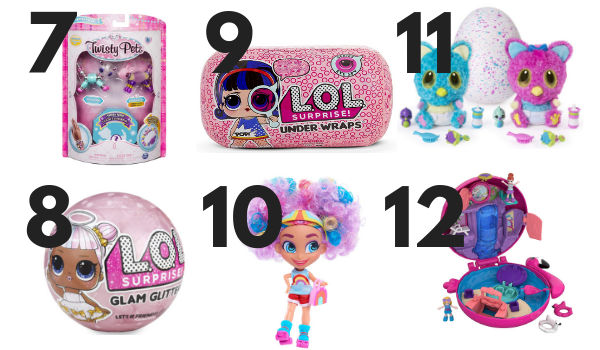 With 7 surprises inside, including a glam glitter doll, outfit, fashion accessory, shoes, water bottle, and secret message sticker, the ball turns into a carrying case that also doubles as a fabulous bath play set. I always keep a few L.O.L. Surprise! sets on hand when we’re traveling to keep my daughter occupied when she starts to get fed up, and the Under Wraps Doll is by far my favorite L.O.L. so far. It comes in a capsule that turns into a carrying purse and includes 15 surprises in total, and what I love most is that you have to de-code secret messages to open the different compartments of the capsule. It kept my sweet girl busy for 30 minutes straight, and I often catch her playing with her L.O.L. capsule after school and on weekends. If your little one is into the YouTube series Hairdorables, he or she is sure to squeal with glee if Santa brings him or her one of these dolls for Christmas! Each package comes with one doll and 10 accessories that are unique to her style and talent, and there are over 36 dolls to collect. Just when you think the Hatchimals craze is starting to die down, another version makes an appearance, and Hatchimals HatchiBabies promise to be one of the hottest Christmas toys for girls this year. The eggs hatch much the same as other Hatchimals, but the HatchiBabies are unique in that they remain babies forever and come with accessories. Do you remember Polly Pocket?! I do, and I have had so much fun reliving my youth through my daughter. We only have one set so far – the Polly Pocket Flamingo Floatie – but Santa has promised to bring more to us on Christmas morning and we’re pretty excited. I love how compact these playsets are as they are the perfect travel companion for on-the-go fun, and the micro doll and accessories are so incredibly cute. Polly Pocket is definitely going to be included on popular kids toys lists everywhere this holiday season. 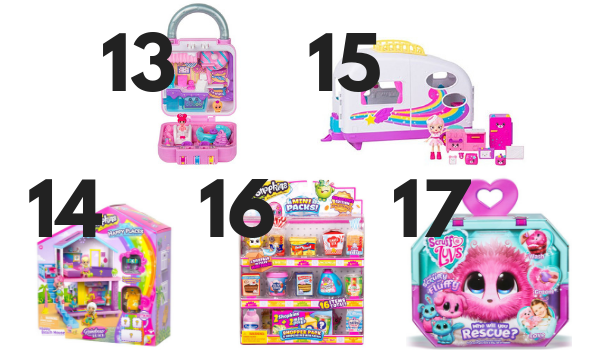 If your little one is Shopkins-obsessed, the Shopkins Lil’ Secrets Secret Lock sets are very similar to Polly Pocket with the added bonus of requiring a secret code to open the playset. We’ve had tons of fun playing with our Lil’ Secrets sets and while I can’t say there’s much difference between these and Polly Pocket, I feel as though my daughter prefers the Shopkins set simply because she knows the brand and characters so well. While we don’t own any of the Shopkins Rainbow Beach playsets (yet), we gifted this toy to my daughter’s BFF for her birthday in September and I’ve heard nothing but good things about it since. In all honesty, I don’t think you can ever go wrong with anything Shopkins-related, and if you’re looking for the best Christmas toys for girls, this is the new line of playsets from Shopkins to look out for. You can give this as a stand-alone item or pair it with a Shopkins furniture set, which doubles as a great stocking stuffer! The possibilities are endless. If your child already has the Happy Places Rainbow Beach House Playset, or you’re buying for another child and you’re worried someone else will buy the playset before you, the Happy Places Rainbow Beach Camper Van is another great option. It includes a sleeping area, mini bathroom, and a kitchen, and can be paired with other Happy Places furniture sets your child already has for creative fun. When I first started searching for the best Christmas gifts for kids for 2018, I was determined to move AWAY from Shopkins, and even though I’ve already included a few Shopkins-themed ideas above, I have to include this one as well. I grabbed this on impulse as an ‘airplane surprise’ for our family vacation in August, and I was surprised at how much fun my daughter and I had opening these together. We were particularly excited to see some of our favorite characters from seasons 1-3 make a comeback, and I would recommend opening the package ahead of time and wrapping these individually as they would make fun stocking stuffers! The last ideas on my list of best Christmas toys for girls this season is the Scruff-a-Luvs Mystery Rescue Pet. The idea behind this toy is really sweet and cute – you receive a messy mass of matted fur, and once you bathe, dry, and brush your Scruff-a-Luv, you will find out if you have a dog, cat, or rabbit. We’re excited to add this to our Christmas list this year, but the last time I looked, they were sold out EVERYWHERE. If you see one, make sure to grab it! As you may have noticed, finding the best Christmas toys for girls is sort of my wheelhouse. Between my love for online shopping and my daughter’s love for YouTube, the 2 of us are always up-to-date on the latest popular kids toys, which can actually make the holidays a bit challenging for me since we already own a lot of them. The good news is that we don’t discriminate when it comes to toys in our household, and this list of the best Christmas toys for boys has us pretty excited. Unlike Pomsies and Lil’ Gleemerz, which are cute and fuzzy and say nice things, Grumblies become angrier the more you provoke them, making them among my most recommended Christmas toys for boys. With more than 40 different reactions and sounds, you can poke, shake, tilt, and roll your Grumblies to enjoy the full range of their unique personalities! Fingerlings have been one of the most popular kids toys for a while now, but there’s no denying they were originally tailored toward girls. We’re had so much fun with our Fingerlings, which is why I’m SO excited there are now uglier and wilder versions available for boys! While boys don’t typically enjoy playing with dolls the way girls do, that’s not to say they don’t like to snuggle up to their favorite plushy when they’re feeling sick or sad, or to help them settle down to sleep at night. There’s really not much to this toy, but the name coupled with their ugly yet strangely adorable look is sure to make even the toughest heart melt! If your little one is an Incredibles fan, look no further! This Jack-Jack plush is full of surprises – he laughs, giggles, and explodes with different colors, lights, and sounds – making him one of the best Christmas toys for boys aged 3 and up! Action figures are always a great gift option as they encourage kids to be creative and allow them to re-create scenes from their favorite movies and TV shows while also coming up with their own. There are heaps of great action figures you can buy for the boys in your life, and if The Incredibles made an impression on them this past year, this might be just the playset to throw into their stockings! There are so many cool and fun interactive toys for girls on the market these days, like Fingerlings, Little Live Pets, Pomsies, and Lil’ Gleemerz, and I often notice the boys in my daughter’s class are intrigued when she brings them to school while also being a bit standoffish. I think they assume they are ‘girls toys’ and that they aren’t supposed to play with them, which pains me to no end, and when I saw Crate Creatures Surprises while looking for the best Christmas toys for boys, my face lit up. They come in a crate you have to pop open with a crowbar (LOL), and they vibrate and make noise when you pull their tongue. They are also interactive in that they make noises based on what you do with them, and they can also record your voice! Hasbro’s FurReal Friends have been on the market for some time now, but the Munchin’ Rex version appears to be geared more toward the little boy(s) in your life. With over 35 sound and motion combinations, this prehistoric pet begs for treats and if you feed him a little broccoli (included), he might just try and spit it out! While we’re not into Treasure X over here, I have heard nothing but great things about these treasure sets from my mom friends who have boys. My understanding is that they are sort of like L.O.L. Surprise! sets for boys in that they have 10 levels of adventures, 3 treasure blocks, 9 folding action figures to reveal and collect, and a map, coin, and digging tool to help you discover your treasures. I feel like kids are very obsessed with poop these days, and this game is sure to make the list of best Christmas toys for boys this year. I love that it can be played independently, but I think it’s safe to say your little one will want to play this with his or her friends, and will be bugging you to add it to the list of activities you do together as a family over the holidays! If your little one is into Jurassic World, this Imaginext gift idea is one you shouldn’t pass by. It comes with a holding base, projectile launcher, 2 projectiles, an Owen figure, a vehicle, and it is sure to provide HOURS of fun. According to my mom friends, this Harry Potter Coding Kit is one of the best Christmas toys for boys this year, and it’s a great way to help your little one get his or her feet wet with coding. It requires a tablet, which obviously isn’t included in this kit (ha! ), but there are over 70 different creative challenges your kids can try, and there are step-by-step instructions for each. Suitable for kids aged 6 and older, I love that kids can enjoy this even if they have ZERO coding experience, and that you can do this together or allow your child to try it as an independent activity. I included the pink version of this toy – Bella – in my list of Christmas toys for girls, but in case you skipped over that section in favor of Christmas toys for boys, I wanted to mention it again. We have both Bella and Boris and love them equally. Their long arms are perfect for hugging, and they do so many fun things. They makes adorable noises when you throw them in the air, they burp and toot, they giggle when you tickle their tummies, and they can even record and repeat things you say. While we have a soft spot for Bella given that we got her before Boris, they are both a huge part of our family and have provided endless hours of entertainment to my daughter. I highly recommend this toy! I’m pretty sure Dash made the 2017 list of best Christmas gifts for kids, but I’m including it in this list as it was such a hit with my daughter and I know any other child who is new to coding will love it just as much. Dash was actually part of her 2017 summer camp curriculum, and she raved about it non-stop. I have heard of schools incorporating Dash into their school curriculum as well, and highly recommend looking into this as a gift idea for kids who show an interest in working with and programming robots. If your kids love LEGO and Harry Potter, this is must-buy this season! With 10 mini-figures, buildable Basilisk and Fawkes creatures, this set has over 878 pieces and the finished Hogwarts Great Hall measures at 14 inches in height! It’s designed for kids aged 9-14, but that doesn’t mean younger Harry Potter fans can’t enjoy this set. They may just need some extra construction help from you, making this a great family activity for the holidays! While you’ll see this PJ Masks Super Moon Adventure set on a lot of Christmas toys for boys lists, my daughter has been playing with PJ Masks for years. Santa brought her the original HQ play set for Christmas a couple of years ago, and I’d hazard a guess she’ll be putting this on her 2018 list. I particularly love that you can launch Gekko out of his space rover, and Gekko looks pretty adorable in his Super Moon space suit, don’t you think? 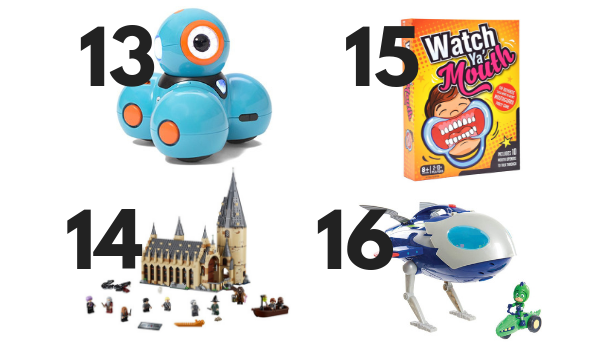 I hope this list of the best Christmas gifts for kids helps you select the perfect toy(s) for the little ones in your life. Remember that popular kids toys tend to sell out well before the holiday, so plan ahead and act quickly when you find something on your child’s wish list, and don’t be afraid to indulge and buy something extra special! If you found this collection of the best Christmas gifts for kids helpful, please share this post on Pinterest! And if you’re looking for more parenting-related tips and tricks, please follow our Parenting board where we share all kinds of great ideas we find each day!